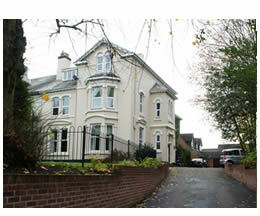 Safeharbour, 260 Hagley Road, Pedmore, Stourbridge is a large Victorian semi-detached property set back from Hagley Road, in a residential area of Stourbridge approximately one mile from the town centre. The house has six bedrooms, one ground floor, four first floor and one second floor room. Five bedrooms have en suite facilities, with one adjacent to the specialist disabled bathroom. Safeharbour has two large lounge areas, with furnishings and entertainment facilities as well as extra areas for dining, a dining room and a large functional kitchen on the ground floor. To access the first floor there is a stairway from the hall. This leads to four bedrooms and one large specialist bathroom. A stairway leads to the second floor, this area has one en-suite bedroom, the administration office, storeroom, Snoezelan therapy room and an additional bathroom. Safeharbour has a grassed garden at the front of the house with bushes and a swing within a fenced area. There is a small courtyard with mini green house to the rear of the house. The driveway and car park is ample enough for eight cars. Safeharbour can accommodate six people. All bedrooms presented are fourteen square metres or over (see house map). Each bedroom is for single occupation. This conforms to the standards laid down in the Health and Social Care Act 2008.